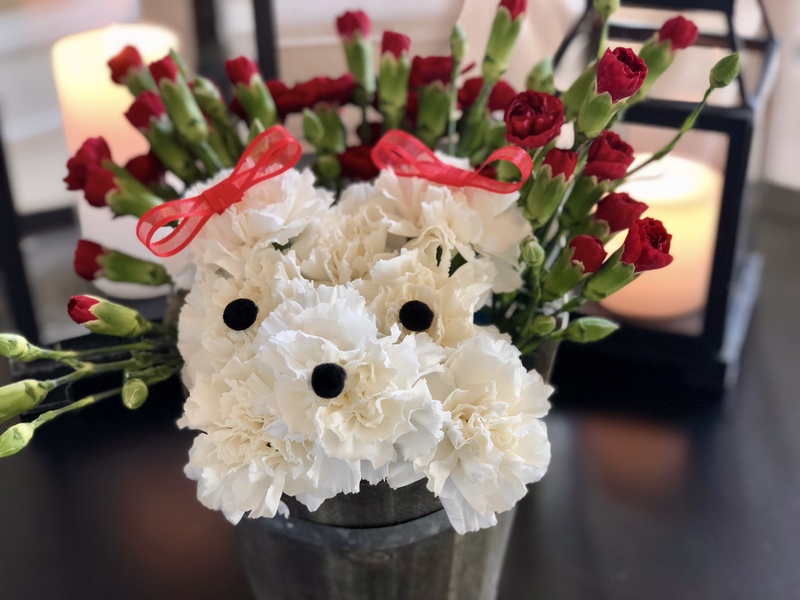 This adorable puppy bouquet is a perfect Valentine’s Day gift for an animal lover or anyone near and dear to your heart. Parents, spouses, significant others, siblings, friends, or kids will love and appreciate this cute floral arrangement. For my bouquet, I used real carnations and a wooden pail. The foam mold should extend 1 inch above the rim of the container. If you are using real flowers, make sure to use a floral foam mold, one that can soak in water. If the container is not water proof, line it with plastic, I used a zip lock bag. Place one flower in the center of the foam, leaving an inch or two of stem. This will be the puppy’s head. Place two more flowers on each side of the center flower, slightly higher and angled. These will be the puppy’s ears. All three of these flowers should be touching. Insert three more flowers below the head and ears. These should be angled to face slightly forward. The center flower will be the puppy’s nose, and the two other flowers placed on either side will be the eyes. The nose should be raised higher than the eyes. Insert two more flowers below the nose to fill in the face. Using a glue gun, insert the eyes and nose in the center of the appropriate blossoms. The eyes should be close enough to the ears to make your bouquet appear more puppy-like. Create a couple small bows made from red ribbon. Attach the bows to the ears using a glue gun, for a cute puppy appearance. Fill in the container with red blooms to create the perfect Valentine’s Day gift. This little guy warms my heart and my kids love him too. Wishing you all a very happy Valentine’s Day!! If you decide to make a puppy bouquet, please share your pictures, I’d love to see them. Sign up to receive more DIY and Holiday ideas delivered right to your inbox by subscribing to Happy Haute Home. Happy Valentine’s Day to you too Ingrid and love to your family as well! So clever, Denise. I would not expect any less from you. Aww thanks Donna!! Have a great Valentine’s Day!